Can you hear that howling? No, that’s not Aitza after Shade accidentally steps on her mangled, detached toenail. That’s the sound of Halloween in the air. I can feel my were-cells starting to mutate. In preparation, I’ve started constructing Shade’s costume. In true goofy fashion, Shade decided to be a Zombie Taco Cat. This freak-show abomination, created in my own basement laboratory (yes, I have a Florida basement), is the genetic splicing of a zombified human, your common domestic Felis catus, and a savory, crunchy Mexican entree. 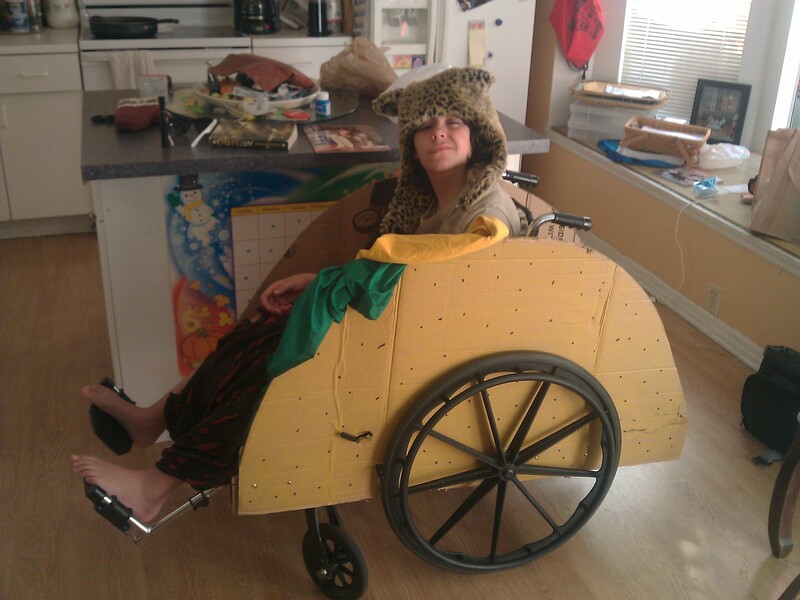 I’ve already applied the giant crispy tortilla shell to his spare wheelchair. That took a lot of tortillas. I’m going to wait until the night before Halloween to cook up the 50 lbs. of ground beef to pour on him. Otherwise, he might start to stink. Talking about Halloween, our Indian Guides program is involved in our Halloween carnival tonight. We have tons of games, bounce houses, silent auction, cake walk, an extremely scary haunted house, and this year, a special storytelling show with Chief Jack-O-Lantern. (Yes, I am Chief Jack-O-Lantern.) My show will have stories, songs, jokes and interactive pieces for the kids. Highlights will include an Interview with a Zombie and The Man Eating Chicken! And remember the song “Great Green Globs of Greasy, Grimy Gopher Guts”? That’ll be in there, too. I was asked to do a show as an alternative to the haunted house because allegedly we scare the poop out of little kids. Last year, a mom came up to one of the dads, Tony, and screamed at him for psychologically scarring her kid. I’d say that’s a resounding endorsement for our haunted house. This year, we’re doing a haunted circus theme with tons of evil clowns. Everyone loves clowns, right?